Naturally, everyone freaks out. The maid makes a family recipe that's supposed to cure laryngitis but mainly just smells like a dead animal. The kids want to cancel Christmas, because they can't imagine being happy on such a miserable occasion. 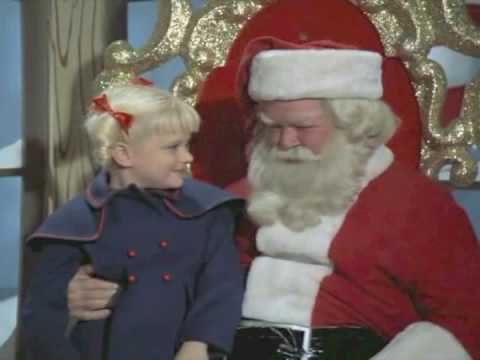 And the youngest, Cindy, goes to tell a mall Santa that the only thing she wants for Christmas is for her mother to be able to sing. That last bit is most of the plot, incidentally. He promises her a miracle, which doesn't sit well with her father, who confronts the mall Santa in the break room. They trade words, and the episode is slightly more ambiguous than usual as to whether or not he's the real deal. But by now Cindy's certain Kringle will deliver, and nothing her dad can say will shake her faith. At any rate, Christmas morning rolls around, and low and behold, Carol can sing again. I guess miracles can happen (at least to privileged, upper-middle-class white people in California). With her voice restored, she gets to have her damn solo in church. The family watches on gleefully, and Cindy gloats about being right. I guess Christmas is saved or something. Of course, those of us who sat through the aforementioned TV-movie already knew this was coming: the whole thing culminates in a flashback to her singing. Because apparently this moment was such a cultural milestone it justified a callback. I've never understood the significance of this series: it's wholesome far past the point of being cloying, the jokes are empty, and the characters are cheesy and one-note. None of it's funny, touching, believable, or relateable - it's just congealed idiocy. The best thing I can say about it is what I said before: at least they waited nineteen years before acknowledging the holidays again.